Both insulin-dependent (IDDM) and non-insulin-dependent diabetes mellitus (NIDDM) are powerful and independent risk factors for coronary artery disease (CAD), stroke, and peripheral arterial disease (1–3). Furthermore, when patients with diabetes develop clinical events, they sustain a worse prognosis compared with nondiabetics (4). Ultimately, atherosclerosis accounts for 65–80% of all deaths among North American diabetic patients, compared with one-third of all deaths in the general North American population (3, 5, 6). A two- to fourfold excess in CAD mortality among diabetic individuals has been noted in a number of prospective studies encompassing a variety of ethnic and racial groups (7). 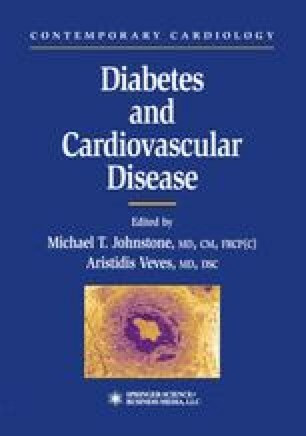 Diabetes also increases the likelihood of severe carotid atherosclerosis (8,9) and mortality from stroke is increased almost threefold in diabetic patients (1).